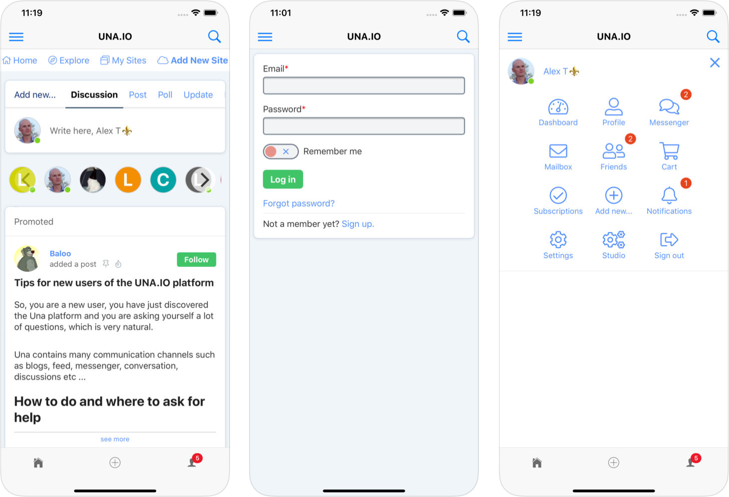 The very first public build of ReactNative apps for UNA is available for testing. These are compiled for UNA.IO website specifically, so you install them and use with your UNA.IO account to test and tell us about any issues you may find or any ideas on improvements that you think would be needed in the nearest future. Please, note that this is the very first version, which we keep as simple as possible. From this stage, we plan to start adding new features and making adjustments regularly. Both apps will allow you to receive native push notifications and generally use the site without the browser. We plan to test them actively over the next two weeks and then release updated versions, along with their source code to the community. UNA Native apps connector for your own site will be available as part of Pro and Cloud subscriptions or to be purchased separately for $100 (one-off fee with 1 year of updates and support included). The source code for both apps will be publicly available for review. Developers are welcome to fork and commit improvements. Both apps will be released under MIT license. - Separate navigation builder for the launch bar - so you can include, say, a Messenger or Market icons into it, if those modules are installed. Since some sites don't have certain modules installed or may have their own priorities, we don't include those links by default. - Standalone Messenger apps for iOS and Android. Often it makes better sense for some sites - having two separate apps, or just one Messenger app as native. - Speed and functionality improvements in Timeline, including getting rid of duplication of posts when channels are used, change in pagination system, improved caching and improved database queries. - Eventually using JOT interface as the main UI option for the apps, which will allow for nearly instant UI response, making the apps look and feel more like fully-native. Yes, you will get the source code and instructions on how to rebrand and compile them as your own packages to submit to Apple and Google as your own apps connected to your site. Downloaded and will be testing and report back with any issues. Thanks!! Andrew Boon where would you like the report sent/posted? Ideally to Discussions, new topic for each, so we can follow up, talk about it and use the link in issue tracking. Downloaded android. No issues, logged in with UNA account and up and running now. Downloaded, will test and comment back. Just a question, how do I go to messenger? When we add a menu builder you’d be able to add it to launch bar. But we currently can't download it correct, until further notice? Apps are available for UNA.IO site - via the App Store. We are basically making them available for testing on our site first. Apps will be available as a product, (so you can create apps for your site) in a couple of weeks. Damn... This is gonna take una to the next level! I love it already and I can't wait to have mine. Though I basically developed a web app for my website some months ago. But this is definitely cooler and I'm sure everyone wants it. It should be possible, but the particular functionality is dependant on the Android device, what is your Android OS version and device type ? Cool. I have it now on iPhone. How can I translate it? how use it on my website?? From coast to coast, UNA is the most. From east to west, UNA is the best! A bit of activity showing from the mobile app. We are getting reports and suggestions aplenty - so the apps should be getting ready for release soon. Yes, there a few things we're working on. First, we will improve the loading speed of some heavy pages in UNA in general, such as pages with Feeds (homepage especially), potentially using asynchronous loading of data items and other tricks. The apps will also change behaviour a bit to improve perceived speed and eventually work with more ReactJS elements to give that "instant reaction" feel of purely native apps. Just a question...we have to pay to have our app on Apple correct? Apple charges $100 a year for developer account. Under that you can have as many apps as you want. To have your app on Apple store it is $100 a year. Your app must be very clean and Apple can be picky making you do some improvements in order to finally be accepted. The review process can take a week at the most. Android is just a one time fee of $25 and the app is usually accepted in 24 hours tops. They are less picky than Apple is. When is the official launch date ? We have to release UNA 9.1 to make the apps work, so it’s about 3 more weeks. The source code will be released earlier though, so you’d be able to start customising and preparing your builds. Will this app be available to purchase with Super Apps? Great, thank you for responding! YES!!! YES YES YES YES !!! FINALLY !!! I-am-so-happy!!! Thank you ! Now I can apply my website to a province of Cambodia for testing. This is great guys. Hugs and beer to you all. I also found out what was wrong with my website. It turned out that the internet company had blocked my IP from accessing my sites. Political stuff. Now I use the Tor-browser for a while, while the government is filing a lawsuit against them. I might require your paid services at some point though, but we can talk about that when it becomes relevant. First for testing the system on 2.5 million people. I hope the app does not have a self-destruct mechanism or something ugly like that. Will there be a way to use the mobile "share via"... So if people find articles online they can easily share directly to the app? Awesome Andrew! Thanks for the update. Is it possible to download the apk file? I don't have my phone and won't be back to get it for a while. I can use the apk on my laptop, but can't download it from G-store. As for the cost... The plan is that all apps - iOS, Android, MacOS and Win will be part of Pro and Cloud plans. No extra cost. To buy separately they'll be $50 each (including 1 year of updates/support). If your Pro plan expires nothing happens - the PowerApps will stop updating but will keep working as usual. When you reinstate the Pro plan they will start updating again.